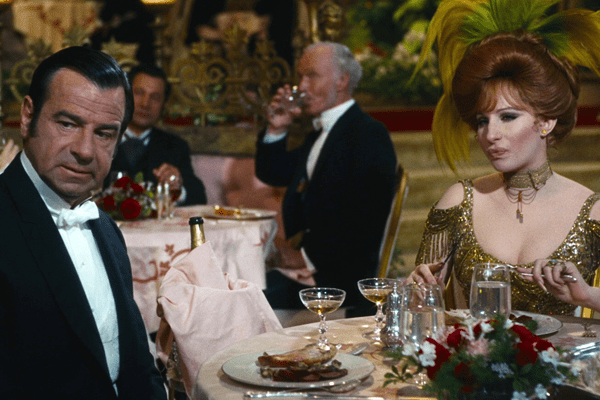 Matthau gives a good imitation of W. C. Fields to Miss Streisand’s Mae West, but the picture is not his, nor is it the youngsters’ — Michael Crawford, Marianne McAndrew and E. J. Peaker. It belongs to Miss Streisand, who visits it looking great (and something like an eccentric kewpie doll) in Irene Scharaff costumes, and to the production designer, John DeCuir. Yep, this film all about Babs’ singing and the fabulous look of the flick. It’s not a deep, moving story, and the leads — Streisand and Walter Matthau — actively hated each other on set, so there’s zero chemistry. For that matter, the choreographer, Michael Kidd, conflicted so much with designer Sharaff and director Gene Kelly that they weren’t on speaking terms. Considering all the big, complicated dance numbers in this movie, it’s a wonder that filming was completed in 90 working days. Oh, how they hated each other. Photo from the Debbie Reynolds auction catalog, where the dress sold for $123,000. 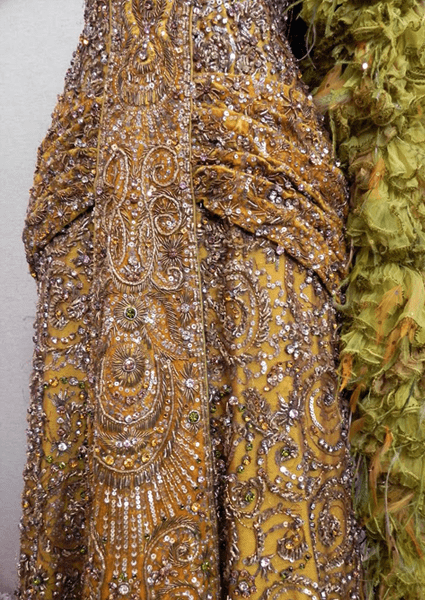 Is it a precisely accurate 1890s evening gown? Not really. But it’s gorgeous, and it works for the film. 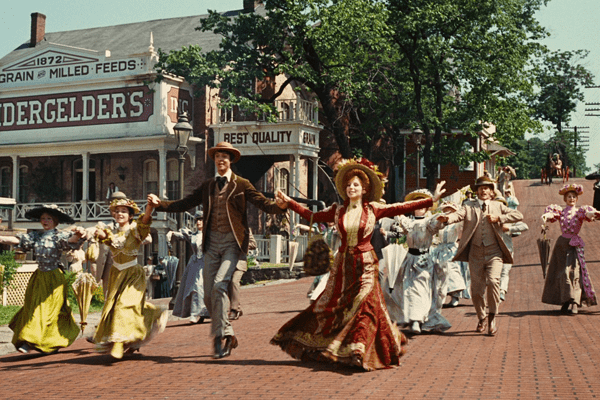 If the classic age of Hollywood musicals had to end, at least they went out with Hello Dolly! as a big bang. Giant ’60s bouffant and doe-eyed makeup? Yep. Weird fabric choices? Crazy claw nails? Yep. And yet these pastel suits look passably good for the period. Really, the silhouettes are alright throughout the film, it’s the materials and little details the make it look 1960s. Then there’s the technicolor palette that was obligatory for all musicals. Irene rocks the Gay Nineties flamenco sleeves, while Minnie tries to look 20 years younger with a childish hairstyle. I’m sure that’s a zipper up the back of her dress, but who cares? Do you think Dolly is still lookin’ swell? I LOOOOOOVE this movie for all the 70’s Gibson girl, art nouveau “interpreted” nonsense! Not the claws. But oh the fantasy! Utter rubbish but gave rise to Laura Ashley! Streisand’s hairstyle was not a 1960s bouffant style. Her hairstyle was a decade too soon for the movie’s setting and more suited for the turn of the century, instead of 1890s. I never had a problem with Streisand and Matthau’s chemistry. I found it rather funny, even if they couldn’t stand each other. Alan Ladd and Veronica Lake couldn’t stand each other, yet they were a vibrant screen team from the 1940s. Also, Streisand and Matthau became friends in later years. 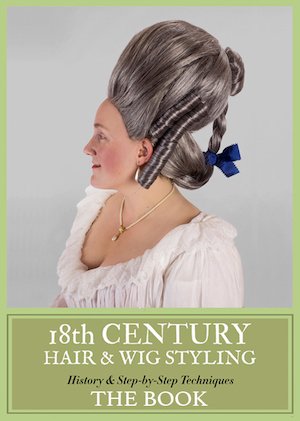 I don’t care how inaccurate the costumes, makeup or hairstyles were . . . I loved this movie when I first saw it. And I still love it. Love this film. Mainly for Tommy Tune (a 6’6″ song and dance man!) and Michael Crawford. But especially for recording the late, great Louis Armstrong, who in the film actually says his name, so we know he pronounced it British style (Lewis) rather than French (Louie). Such details are important to nerds. How’s everyone’s hair so big? Recently-ish saw it on stage and we loved it! With Better Midler and David Hyde Pierce? Jealous! The title number is a real barnstormer, that’s for sure, but “Put On Your Sunday Clothes” is my favorite number. It always picks me up when I’m feeling ‘down and out’. Fun fact: there’s an instrumental version of “Put On Your Sunday Clothes” in the music loop that plays on Main Street U.S.A. Whenever I’m there and I hear it come on, it takes all my willpower not to break into song on the spot. 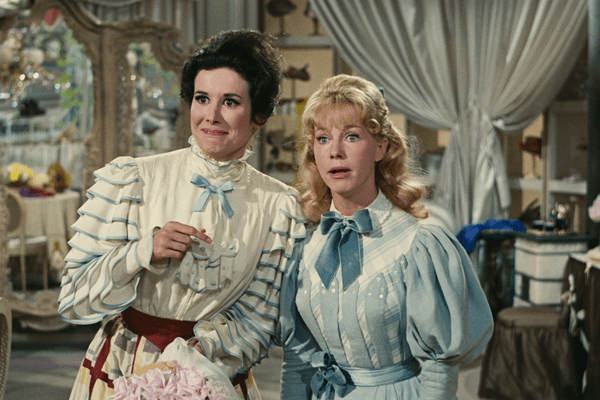 Hello Dolly is one of my favorite musical films. 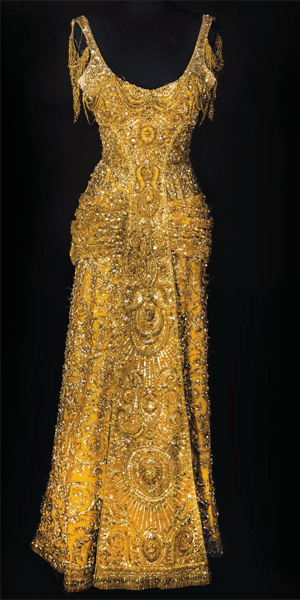 I wanted to get married in that gold dress since my teenage years. I think my MIL would have fainted. I does love me some musicals! 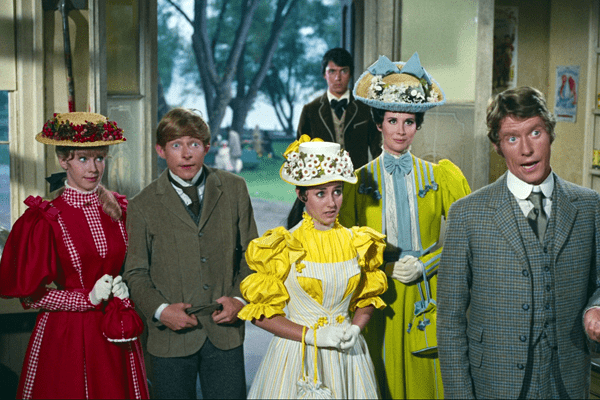 Personally, this film has never made my top ten, mainly because, being of an age that laughed every week at ‘Some Mothers Do ‘Ave ‘Em’ I could never take Michael Crawford even slightly seriously, and his awful yank accent in this irks me. I don’t like his singing voice either. Barbra holds the screen though! 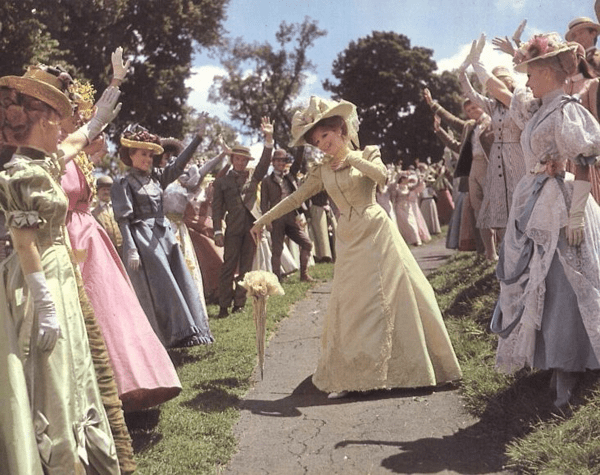 My top ten DOES include My Fair Lady, 7 Brides, Calamity Jane, Kiss me Kate and Kismet though. 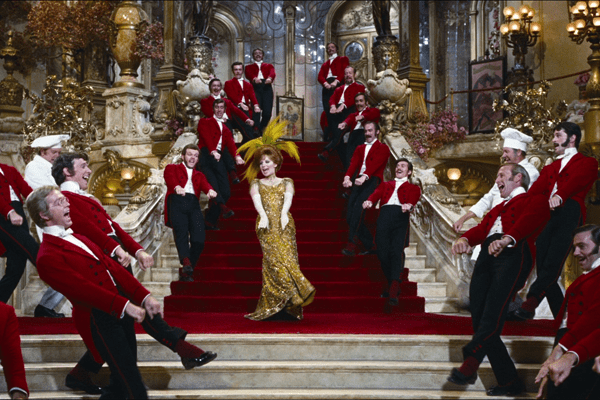 Hello Dolly is memorable for two or three thing: Barbra Streisand, the gold gown & Louis Armstrong. But I do like it. Streisand’s voice is so rich and beautiful. I’d watch it for that alone. I just watched this recently. After seeing it on stage four times in three days being performed by my granddaughter’s kidstage group. I found I appreciated it much more than the first time I saw it. Could the costuming choices be considered a forerunner to Steampunk? I see a lot of similarities in the approach taken with materials and exxageration of details. Other leads suggested were Betty Grable and Dan Dailey, but the studio was hoping to get the ‘youth market’. My mother took me to see Betty Grable in a touring show of ‘Hello Dolly’ in the late 1960s. One of my favorites. Also liked the non-musical version, The Matchmaker with Shirley Booth, Paul Ford, Shirley MacLaine and Anthony Perkins. The Matchmaker is one of my favorite films and is far better than the film version of Dolly, although I have no issues with the stage version. It also introduced a young Robert Morse as Barnaby. I kinda prefer the Matchmaker with Shirley Booth. sure the musical is great but Walter Matthau is very badly miscast and Michael Crawford is to…goofy. I DO love the costumes it has though. The Matchmaker also stays true to the fact that Dolly is Irish, with the maiden name Gallagher. The Levi is from her Viennese Catholic husband. The film of the musical conveniently dropped the “Gallagher” from Dolly’s name so Streisand could play her as New York Jewish. Okay. Now you have to do The Music Man. I have a special place in my heart for Hello Dolly because my mom got to be in it! Her high school drill team marched as the YWCA group in the parade (my mom carried the banner). According to her, the YWCA uniforms and the marching band uniforms were wool, it was beastly hot, Gene Kelly called the drill team droopy drawers and they had to do multiple parade takes because Streisand wanted to make sure they got her good side. I always enjoyed watching this as a kid. The costumes are in the right ballpark but yeah they referenced the 60’s style more than the 00’s. Truthfully, I think this early era suited Streisand’s features. She was never more beautiful than she was in this film or Funny Girl. I love this movie, and I especially love that gold dress, but now I am all intrigued by this legendary animosity between Barbra and Mathau. Anyone have a good source to read up on it?